Is It Time to Buy McKesson Corporation Stock? Shares of this healthcare juggernaut are soaring. 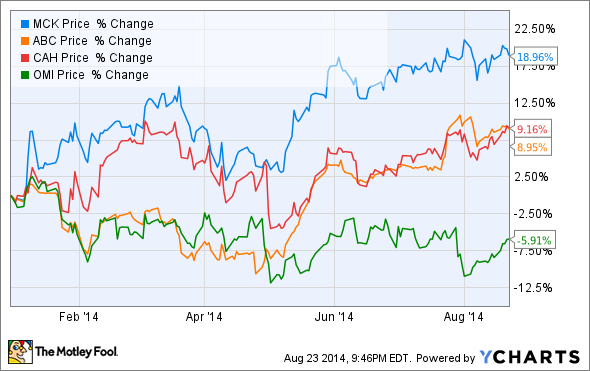 Should McKesson be on your investing short list? If you live in North America, there's a one in three chance that a medication you use was distributed by one company -- McKesson Corporation (NYSE:MCK). Over half of the hospitals in the U.S. do business with the giant health services company. One-fifth of all physicians use technology or services provided by McKesson. Juggernaut isn't a word that can be applied to any company. However, in the world of healthcare, the term definitely applies to McKesson. With many healthcare stocks sizzling, is it time to take a look at buying McKesson stock? You might think that the train has already left the station when it comes to investing in McKesson. The stock has more than doubled over the last two years. Shares are up nearly 20% so far this year -- well above its key rivals Amerisource Bergen, Cardinal Health, and Owens & Minor. With its stock soaring, McKesson's valuation has also vaulted to seemingly lofty levels. The stock trades at a trailing price-to-earnings multiple near its 10-year high. When you look at McKesson's paltry profit margins of less than 1%, you might wonder how much farther this stock can actually run. Then there's the fact that the company's most profitable line of business has lost some steam. Over the last three years, McKesson's technology solutions business segment generated only around 2% of total revenue -- but 18%-21% of total gross profit. However, McKesson sold off its international technology and hospital automation business units this year. As of last quarter, technology solutions only contributed a little over 8% of total gross profit. On the other hand, an argument could be made that McKesson is simply following the "hedgehog principle" laid out by management guru Jim Collins in his business best-seller "Good to Great". Collins maintained that great companies focus mainly on one thing and do it better than anyone else. McKesson already ranked as the No. 1 pharmaceutical distributor in North America. The acquisition earlier this year of Celesio helps position the company to gain a larger presence globally. Celesio, based in Frankfurt, Germany, supplies pharmaceutical products to 65,000 pharmacies and hospitals across 14 countries. The pharmaceutical distribution business typically benefits when more generic drugs are available. McKesson's financial results have certainly been helped in recent years from selling generic drugs. The company expects the rest of this year and into 2015 to bring an increase in the number of branded to generic drug conversions. While there are always some risks related to reimbursement and pricing, this should mean good news for McKesson in the coming months. Last month already brought some good news for the company. McKesson announced a three-year extension of its distribution agreement with CVS Caremark on July 30. That's no trivial deal: CVS is McKesson's largest customer and makes up 16% of its total revenue. With the CVS extension secured and Celesio kicking in additional international business, McKesson upped its full-year earnings guidance by $0.10 per share. The company's management doesn't seem to think a cooling-off is in store. Is it a good idea to consider buying McKesson stock or should investors take a pass? It's not too late to still gain good returns. However, don't be surprised if a pullback occurs along the way from profit-taking or disruptive macroeconomic factors. Over the long run, though, this appears to be a solid candidate to be a part of investors' broader investment portfolio. McKesson CEO John Hammergren stated last year that "no other company in America has the combined footprint that we do in pharmacy and in technology." He was right then -- and still is now. Hammergren also noted that the next decade will bring tremendous opportunities for healthcare organizations to win by improving quality and reducing costs. He's right again. I suspect that McKesson will be one of those winners.